Dubbed the “Sky Train,” the automated system connects the airport’s busiest terminal to airport parking and a nearby light rail station. 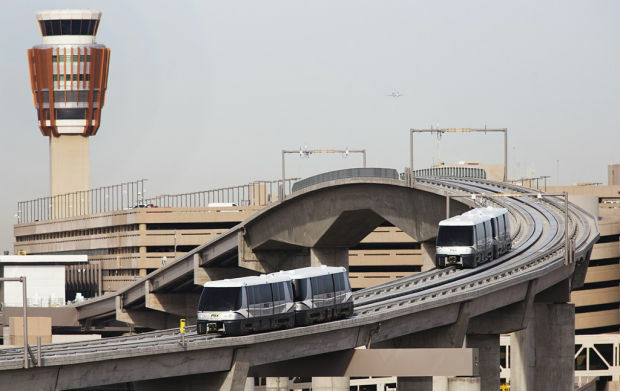 A people mover is among the alternatives being studied by Metro and Los Angeles World Airports as a way to connect the Crenshaw/LAX Line and/or a light rail extension to the LAX terminals (here’s the Metro Airport Connector home page). According to this fact sheet, the 1.7-mile first phase of the project cost $644 million and will take five minutes to travel between the light rail station and Terminal 4. The city plans to extend the system to connect with other terminals and the airport’s rental car center. The Times’ editorial board comes out in favor of the proposed Millenium Hollywood project, which proposes two skyscrapers near the Capital Records Building; the actual heights of the buildings has yet to be defined. The Times’ reasoning: the buildings substantially conform with the Hollywood zoning plan adopted by the City Council last year. The buildings have been controversial and Councilman Eric Garcetti even wrote the city’s Planning Commission last week saying the towers were out-of-scale with the surrounding area and they have yet to earn enough community support. Of course, there are the usual complaints about the project generating traffic. Well, the Millennium project would be a stone’s throw from the popular Hollywood/Vine Red Line station — only 19 minutes to downtown L.A.! I don’t live in Hollywood, but my three cents anyway: I think the Times’ editorial nails the issue. At some point, the city needs to stick with its zoning plans instead of negotiating each project individually, the result being visual chaos and the scattershot city you see everyday. Also this: if traffic is always the criteria for new development, how is it possible to build anything? And how does a city keep its economy afloat if it shuns erecting new buildings or redevelopment of existing ones? Beats me, but I’m only a lowly government blogger. In semi-related news, ground was broken on the Transitbay Transit Tower in San Francisco last week. The 60-story, 1,070-foot tower will host a train and bus station and looks to be one of the more spectacular transit hubs in the nation; it will probably help the Bay Area’s economy and overall livability, concepts I would think other cities may want to embrace or consider. See the renderings here. Cool and creative idea: to celebrate National Library Week, the transit agency that serves the Greater Philadelphia area will host a free virtual library at one of its stations that allows station-goers to get free downloads of some books and podcasts using QR codes. Reaching High in Hollywood – LA Times article: “At some point, the city needs to stick with its zoning plans instead of negotiating each project individually, the result being visual chaos and the scattershot city you see everyday.” Since you don’t live in Hollywood, it’s understandable that you could fail to understand how ridiculous the Hollywood Community Plan truly is – how wrong its premise is for Hollywood! While the census tells us that people are fleeing this area and have been doing so for the last 20 years, the rationale for the Hollywood Community Plan is that people are actually coming into this area! They use this false data and its resultant rationale to pave the way for “forced density” along our gridlocked Hollywood corridor. They go further by suggesting that the increased density situated close to transit will somehow cause people to behave differently by casting aside their cars in place of public transportation. The population of Hollywood from the hills to Melrose south of Sunset will NEVER attempt to take Johnny to soccer, Jane to ballet, shop for groceries, home improvement supplies, school drop offs and pickups, and visit a couple doctors and Rite Aid WITHOUT the use of at least one (more likely two) cars! So, according to the lawsuits in place against this error-ridden Hollywood Community Plan, we need to go back to the drawing board: support the effort to get a new plan in place by visiting SaveHollywood.org! If public transit isn’t for you and you are worried about increased traffic, buy a scooter. It’s a fast growing alternative zippy, fast, fuel efficient method to get around this city. Times change. Get along with it. That’s how West LA residents are coping with higher density living. Imagining a West Hollywood resident on a scooter with his child on the back, driving with one hand and holding a huge piece of drywall on his head with the other while little Johnny’s backpack is filled to the brim with groceries! There are studies that show most people nowadays don’t have the time required for public transit, so add that to the list of reasons people will never completely be able to lose their cars. Most families have at least two and use the transit system as a field trip. Politicians who brag about public transit rarely attend the many meetings and press conferences and ribbon cuttings using public transit. “yourbeachwoodcanyon” has a very valid point. I’ll raise the ante: Let’s give a monthly Metro pass to every elected official who has a vote on urban redevelopment projects, BUT take away their taxpayer-paid car and driver, for the duration of their term. Let them understand how we (in Leona helmsley’s words) “the little people,” live. Let them run personal errands on Metro, go to the grocery market [and take their grocery bags home] on Metro, bring their children to school on Metro, and get to their consituent meetings on time, on Metro. Leona Helmsley – cont’d … Her quote was “We don’t pay taxes. Only the little people pay taxes.” Our elected and appointed officials who ride in taxpayer-funded cars, protected by a taxpayer-paid bodyguard/chauffeur – can modify Leona’s statement to “We don’t ride Metro. Only the little people ride Metro.” Heads up, elected officals. We voted you in, and we’ll vote you out.